2015 has opened with a bang at Autistry! Lots of new faces: students and staff. New projects are starting and older projects are being completed. We are all overcoming the temptation to linger in projects that we love so we don’t have to strike out into the unknown territory of a new project. So the motto for 2015 is Done is Good! Josh finished the Amtrak F40. He has mastered the art of decals. 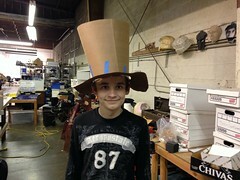 Nat wearing the mock-up of his new hat design. 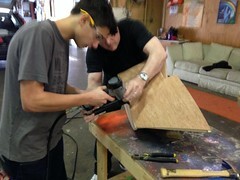 He’ll make it out of thin foam and cover with felt. 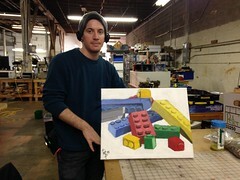 Alex painted a Lego still life for Play-Well TEKnologies (aka the Lego Store). 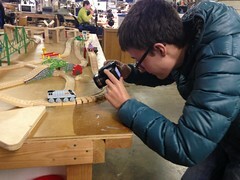 Oliver takes photos for a comic book story with Thomas the Tank Engine. 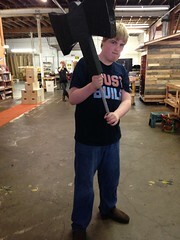 Pierce working on a pirate ship that we hope will be a prototype for more to come. Lauren teaches Dan how to program his new iPhone! 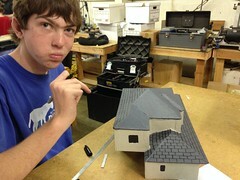 Ben finished his bird house – an exact replica of his home. 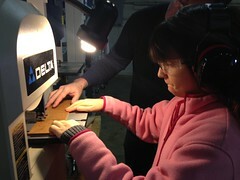 Claire learned to use the bandsaw to create a cool diorama. 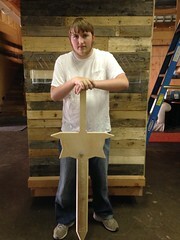 John with the first pass at a sword. More work to do! 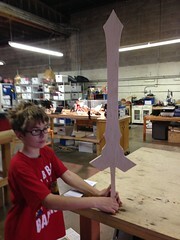 Jacob cut a large sword on the ShopBot – not quite finished yet! This is just a small selection of the many amazing projects happening in the Studio. My personal resolution for 2015: Post More Newsletters! This entry was posted by Janet Lawson, MFT on Wednesday, January 14th, 2015 at 8:16 pm	and is filed under Studio Newsletters, Uncategorized. You can follow any responses to this entry through the RSS 2.0 feed. Both comments and pings are currently closed.